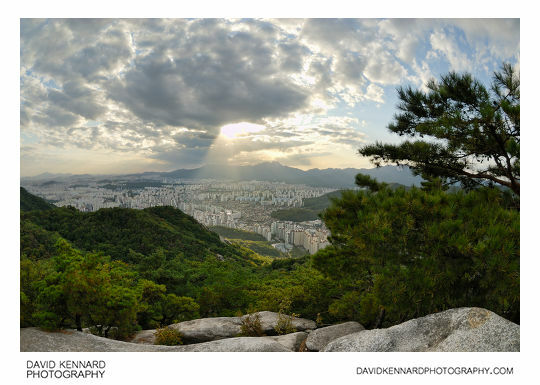 This post is part of a series on my visits to Jogyesa temple, Insadong, Tapgol Park, and Buramsan on the sixth day of my Holiday in Seoul, Korea. If you haven't read the first part, that's here: Korea day 6 part 1 - Euljiro 3-ga subway station and the Korean Postal Museum. 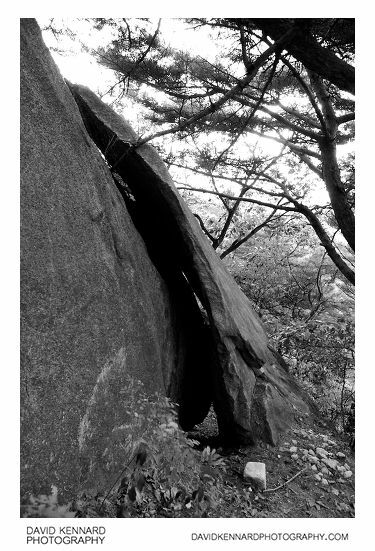 A bit further up the mountain was this strange thin rock leaning on a larger rock. I assume at one time it was all the same rock, but I'm not sure how it would be eroded like that. 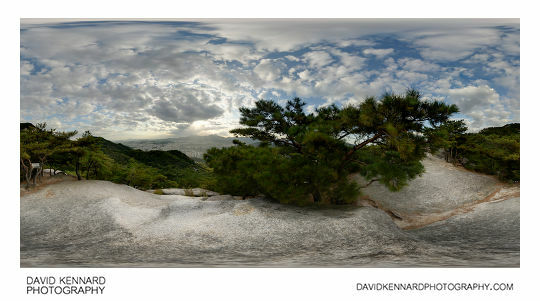 From on top of a rock you could get quite a good view out over part of Seoul. 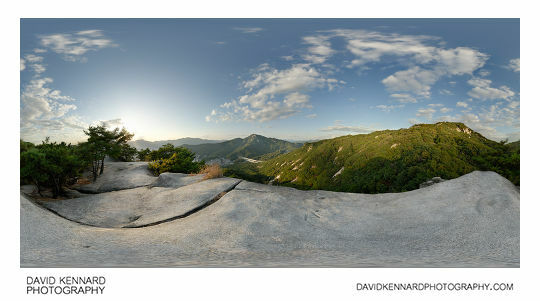 I took a panorama up there, it was quite tricky manoeuvring around the tripod while avoiding falling off the rock. 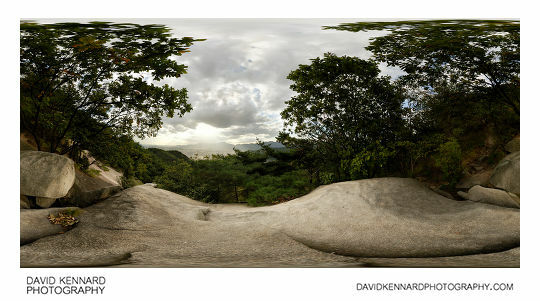 You can view the 360° VR version of it here: Rock partway up Buramsan 360 VR. From a rock I managed to get a shot of the sun shining down on tower blocks through a hole in the clouds. Eventually we reached what we thought was the peak, though when we got there we saw that there was actually another peak quite a bit higher up. From the peak you also get a good view of Suraksan (you can see a road coming out from Buramsan and entering a tunnel through Suraksan). 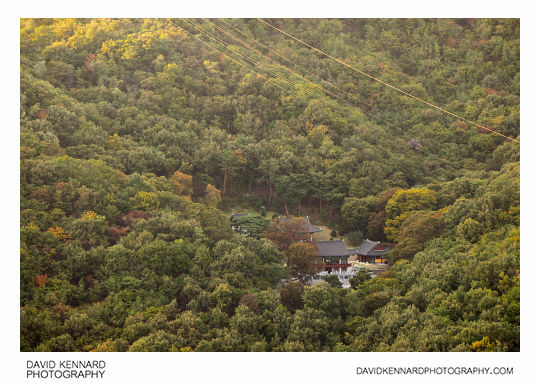 I took some photos of a couple of temples on the slopes of Surakasn using my 70-300mm VR lens. The resulting images were very low contrast due to the long distance haze, so applied hefty contrast boosts when processing the photos. 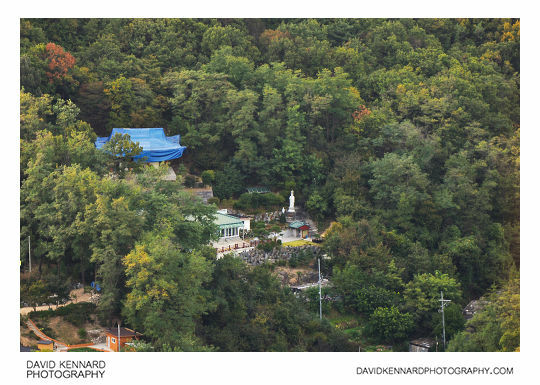 This one is Hakrimsa temple (Hangeul: 학림사; Hanja: 鶴林寺), nestled away amongst the trees. And this is Seokgasa (Hangeul: 석가사) temple. The building in the upper left doesn't have a blue tiled roof, but is covered in a blue tarpaulin. Probably having some building work done to it I would think. In this photo you can see part of the mountain we were on, Buramsan, in the right corner, and Suraksan to the left, with many other mountains in the distance. 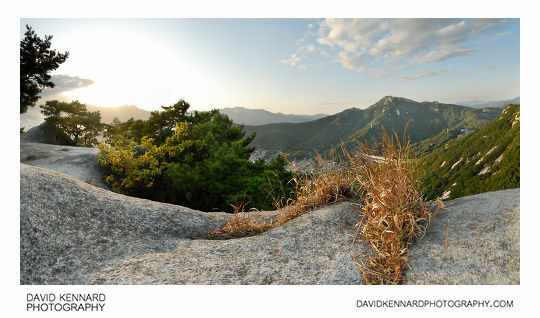 In the valley below is Deokreung reserve forces training ground (덕릉 예비군 훈련장). If you look at this area in Daum or Naver maps though, it looks like a road just going through a forest as they have censored out the miltary facility. I took another photo from the north end of the minor peak we'd climbed to before we decided to head back down. The sun was starting to set and it looked a long way to the actual peak of the mountain, so we decided against carrying on to the real peak.